These are unwanted, used items from charity shops. They come with a history and my work involves adding layers of personal stories to these ‘lost’ items. 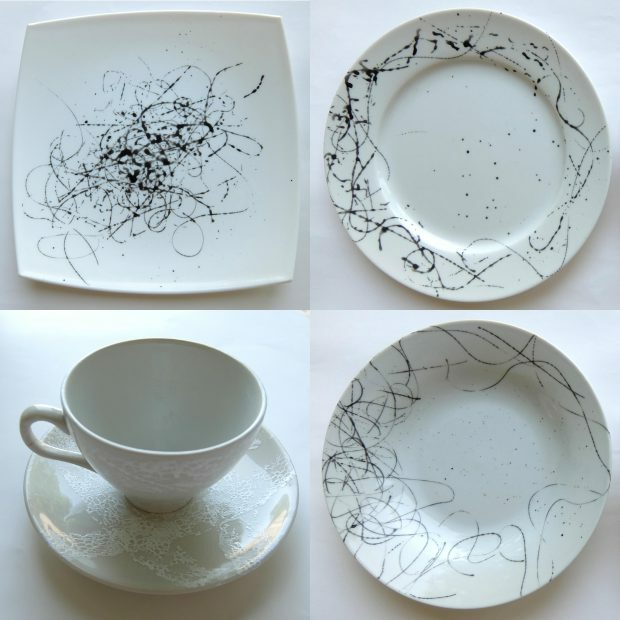 The patterns on the items are made from strands of cotton, wool and lace which were unpicked from my previous works / old garments or bed linen, dipped in black or white paint, which are then used for mark making at different speeds and rhythms. These are boxed frames of ladies and gents handkerchiefs, which have been folded in the traditional way and arranged to invite the viewer to enter into the special stories behind these beautiful old items. I have made a tiny fabric memory box for each boxed frame, to entice the viewer to really look and be fully immersed in the experience.